Improved database availability for HALDB databases is provided by the long-awaited online reorganization (OLR) enhancement. The functionality of the IMS Connect product is included as an integrated function of IMS. DBRC provides a new API that allows assembler programs to query the RECON. IMS Java users will have new JDBC SQL calls and DLI Model Utility support for retrieving existing IMS data in XML format as well as storing, indexing, searching, and retrieving valid XML documents into new or existing IMS databases. We describe these enhancements and all other major changes in IMS Version 9. 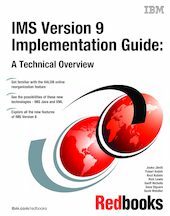 This book gives you the essential information that you need when you are migrating your IMS systems to IMS Version 9.